I read that quote a long time ago and it has stuck with me because it makes me smile. Ralph Waldo Emerson wrote it. At this time of year, Earth is laughing her a** off because everything is blooming now. 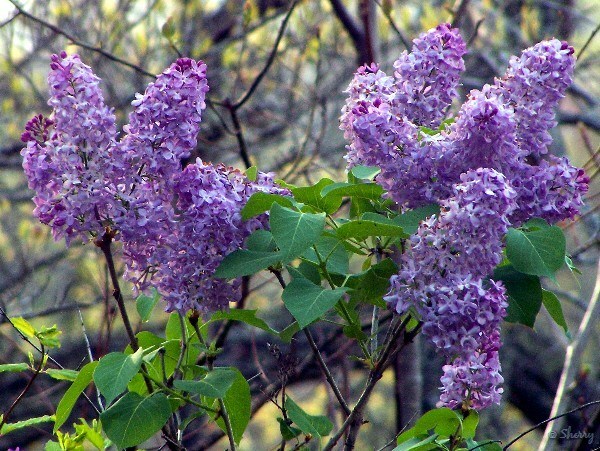 I picked some lilacs the other day – unfortunately John has trimmed it to be more of a tree, so most of the blossoms are on the top. There is no way I am going to climb a ladder for them. They were still not open and I wasn’t sure they would. they are on the dining room table and they are beginning to open. The wisteria is getting ready to bloom – I love the lavender blossoms and their lovely fragrance. but when it finishes blooming, I am going to have John dig that sucker out of the bed – it trails all over everything and is making its way to the other end of the bed where the blueberries are. If I don’t cut its little tendrils all the time, the thing overpowers everything. Even when I do keep it clipped, it sends shoots out to other places I don’t realize it is going. I will admit cutting down things that have been here since we moved in is still a little hard – guess I still don’t quite feel it is “my” house. I think when the kitchen is done and we have our own furniture upstairs, it will be more our house. We finally got the appraisal on Friday, looks like the loan is moving forward. Tom warns me there will be more paperwork – I already have 2 or 3 file folders on it. The Gravenstein apple tree is loaded with blossoms, as are the 2 pear trees. We had wild wind yesterday and I was concerned it would blow the blossoms of before the fruit set. It was supposed to rain yesterday – it was dark and dreary all day but nothing ever came. We had sun this morning and now Eddie noticed it is raining; no telling what it will be in a few minutes. We have pink snow in places because the wind is blowing the petals off the puffy cherry trees. Things used to come in a certain order in Spring, now it is every plant for itself. They seem to bloom when they please and bloom their hearts out. I love this time of year. As soon as the weather is more conducive, I will take some pictures of my own and post them. I appreciate the people who have lovely photos on the web and want to share them as well as give credit where credit is due. We have most of the beds filled with scillas, when they stop blooming I am going to dig things up – small space at a time, put Preen in and see if I can put some colorful perennials in so it doesn’t look overgrown with grass and weeds. It will probably take me all summer since it will be a little at a time – then it will be time to start from the beginning again. I also bought some morning-glory seeds to put on the trellis at the back porch, I love them when they trail up. I had a trellis built for our house in Bethlehem and planted them, loved it. I also had a wisteria tree in the back garden, I was forever trimming the tendrils and had trouble keeping up with them. 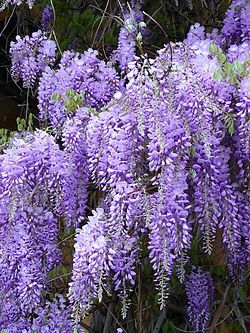 I had a great guy come to mow the lawn for me – an off duty Bethlehem police officer – don’t think they would appreciate having one of their officers strangled by the wisteria. I remember one day I was driving along the street somewhere and saw him. We both stopped and talked about gardening, wonder what the people going by were thinking. It felt a little odd, but also a bit of fun as well. A couple of weeks ago we were driving out and saw a squad at the old bus stop corner and I told Eddie to go over to him – he didn’t want to but I insisted. I wanted to thank him for being out there and for the great job he does. So we had a nice conversation and Eddie gave him his card to come up to the future of Flight. His name is John Holland and he really appreciated it. I do that when ever I see an officer – I even got a hug from a female officer once. They don’t get many compliments and I feel it is important to know there are people out there who appreciate them. I am watching to see what’s next to bloom, I think the rhododendron. Whatever it will be, I will definitely enjoy it. This entry was posted on April 28, 2013 at 11:53 am and is filed under Musings. You can follow any responses to this entry through the RSS 2.0 feed. You can leave a response, or trackback from your own site. There’s something magical about watching a garden bloom. At present we are fighting the pigeons off the plum tree as they keep eating the blossoms meaning no plums! I have the same problem with the birds eating the blueberries. A couple of years we have covered them with nylon net – they still get in underneath but we at least have a some blueberries. At this point, the cherry trees are now bird food. It’s very frustrating! The birds are lovely to have in the garden but I do wish they wouldn’t eat everything!! True, they need to eat to live just as we do. Some of them seem to live to eat and aren’t concerned they don’t leave anything for us.